Everyone likes to sip on chilled beverages. It may be beer, soda, or some flavored juices. However, there are instances when we do have the bottle of drink in our hands yet we cannot drink it. Why? – Because we don’t have a bottle opener with us. Let’s accept it. 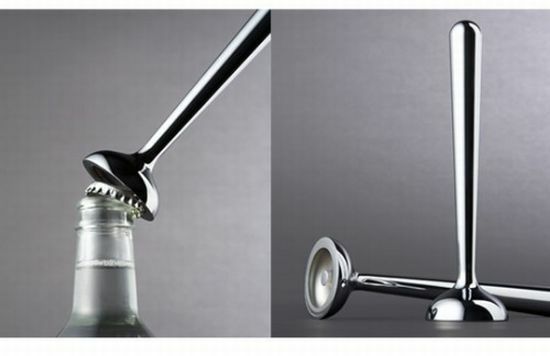 A Bottle opener is not the kind of device we would want to move around with. It is small, simple, and extremely boring to look at. You would rather not drink the bottle than carry that dull thing with you. 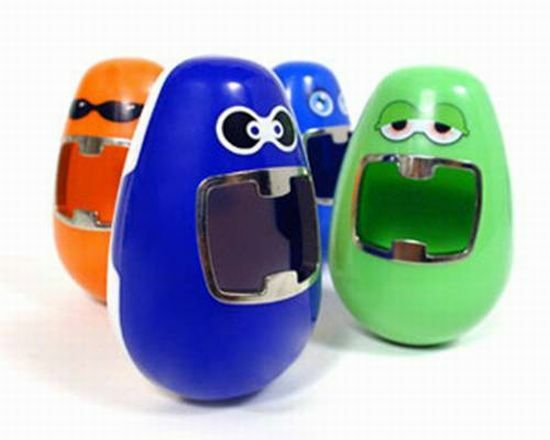 But the dull bottle openers are not dull anymore, for they have received the right makeover. Now you can carry them in style and even flaunt them to your friends. Have a look at some of the geekiest bottle openers we have brought for you. It can’t get any cooler than this! 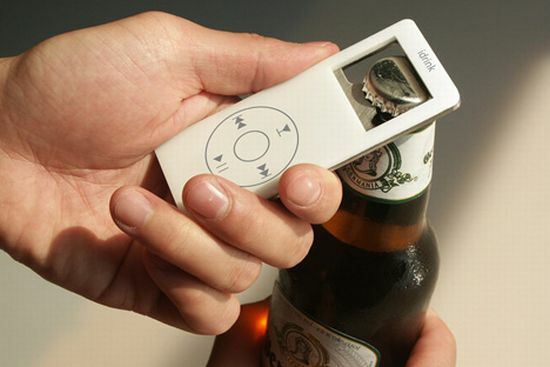 For all geeks who just cannot get enough of their iPod and iPhone, the “idrink Bottle Opener” is the right thing to carry along. The additional igadget to their already long list is a great way to show love for igadgets. Most of us carry a USB flash drive with us everywhere we go. This small gadget helps us to store documents, files, and much more. 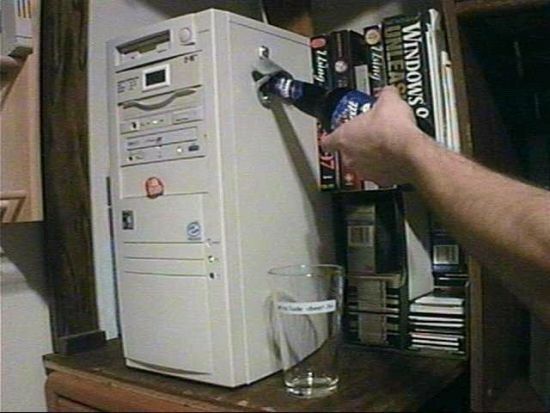 But with the new USB bottle opener, you can also open your bottles. 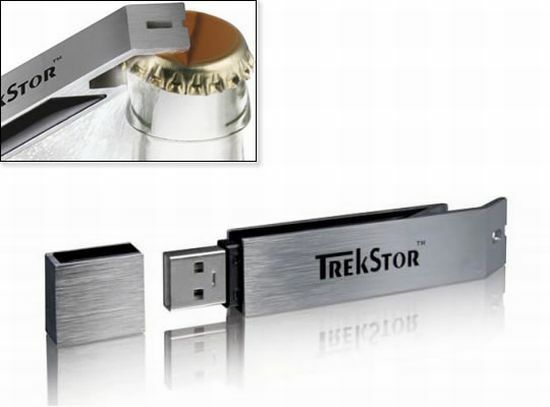 The “USB Flash Drive Bottle Opener” is a great way to combine functionality of two gadgets together. Why open one bottle cap when you can open two at the same time? This “Redman” or “Double Whammy Bottle Opener” can open two bottle caps at a time, and when not in use, the Redman can stand on his feet just about anywhere you want. Kitchen accessories inspired by metal spare parts? Sounds weird, right? But someone did make something out of it, and that too, in a unique manner. The “Top Gear Bottle Opener” is a perfect tool to open your soft drinks or much favorite beer pints. You just got to hook the opener to the metal cap, push, and then pull it back. 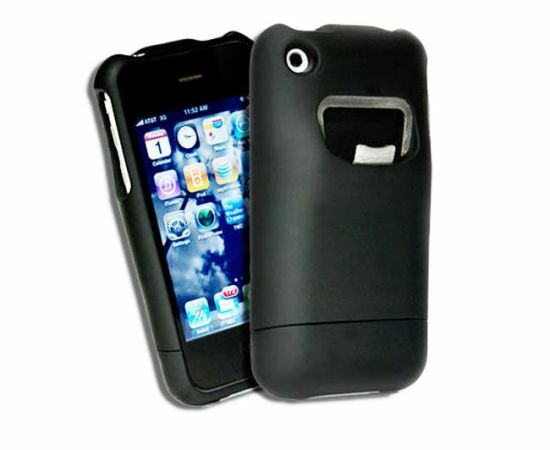 The “iBottle Opener” is a unique and handy iPhone case, which includes a bottle opener at its back side. This is for all the Apple lovers who love to flaunt their igadgets. Going for a party and want to flaunt something geeky? 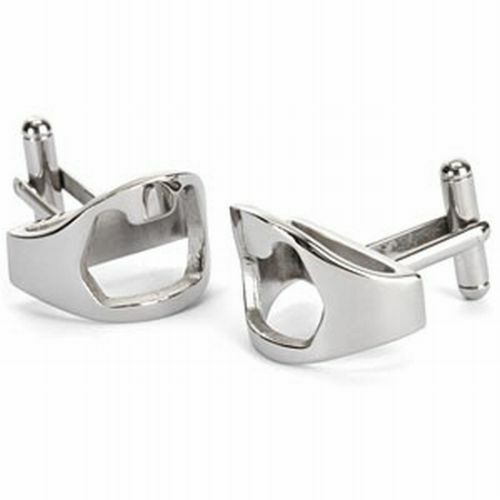 The “Cuff Links Bottle Opener” is a nice thing to wear, which will also complement your style. The Cuff Links are decent and classic enough to look at. Most of you must be having a bottle opener in your keychain. However, the opener makes the pocket look and feel bulky. 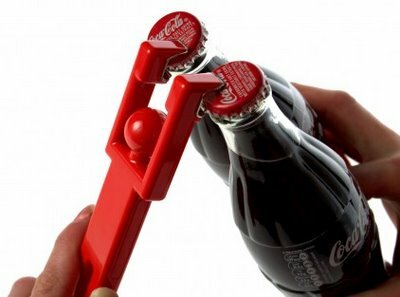 So now you have a unique way to open your bottles. 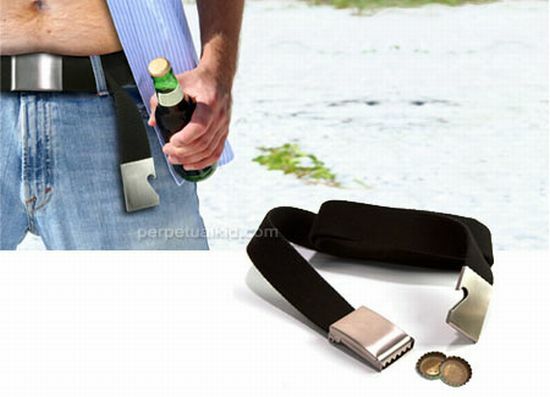 You can use a bottle opener on your belt. This “Belt Bottle Opener” will help you open the bottle caps of your favorite drinks, and will also hold your pants firmly at the same time. The “Leonardo Decapper Bottle Opener” is one of a kind bottle opener for home bars. This bottle opener has got a silver look, and it removes caps in one easy push. You can also engrave any message up to 10 letters per line on the opener, to make it unique and be a personalized gift to someone special. Yes, you heard it right. 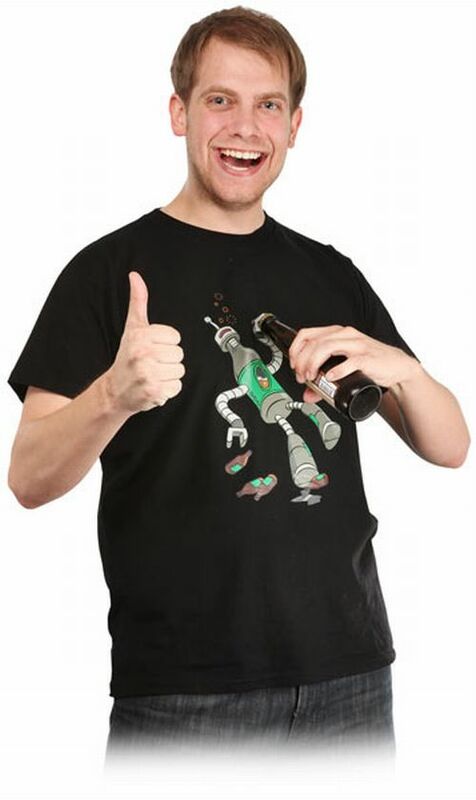 “BeerBot Bottle Opening Shirt” lets you open your beer or any cold drink bottle anywhere you want to. The geeks have done it again with this innovative idea of placing a bottle opener on a shirt. Attached on a black shirt, the tiny robot bottle opener lets you open your beer or cold drinks bottle at an ease. You just have to place your bottle or the cane into the hands of the robot attached on the shirt, tilt a bit, and it will open the bottle in one go. Seems like there’s never a bottle opener around when you need it? 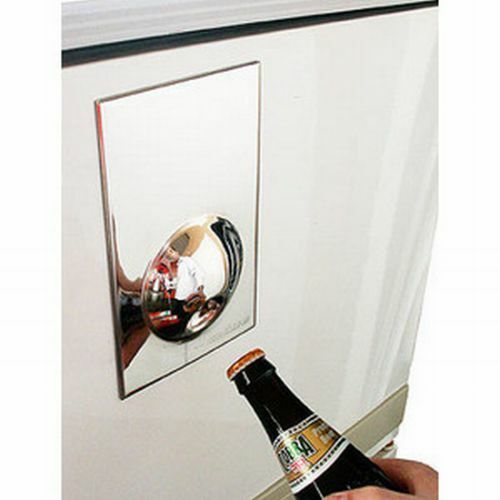 Well look no further, as the “Wall Mounted Bottle Opener” can be mounted at any place convenient for you. Instead of always having to look for your bottle opener in your kitchen drawers, this “Fridge Magnet Bottle Opener” keeps it nearby. This opener is attached to your refrigerator, which turns out extremely handy. You don’t have to search for your opener anymore. You often long to sip on your favorite cold drinks while watching TV, but while searching for a bottle opener, most of the time you miss out on your favorite scene or some important part in a TV program. 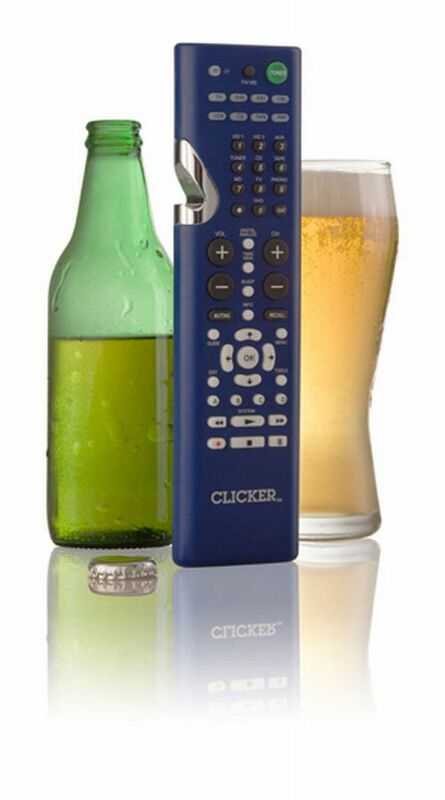 Now simply get the bottle of your chilled drink out of your fridge, and instead of searching for a bottle opener, use your “Clicker Universal Remote Bottle Opener” to open the cap. This opener is molded on a remote and of course needless to say, you can even use the remote to surf your channels. “Heel Bottle Opener” is one of the weirdest but unique-looking bottle openers, especially for girls. The shoe has got opener at the back of the heel. 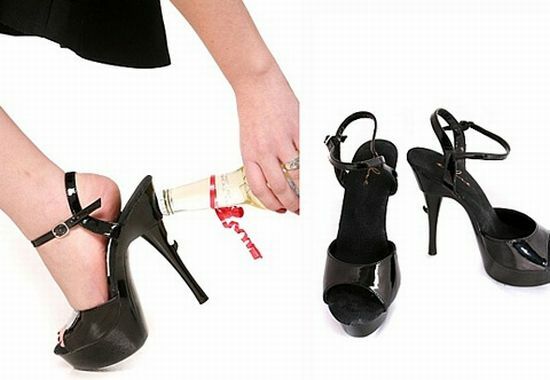 This “Heel Bottle Opener” can be perfect for parties, and will definitely grab attention of people when you crack open the cap of the bottle using your heels. 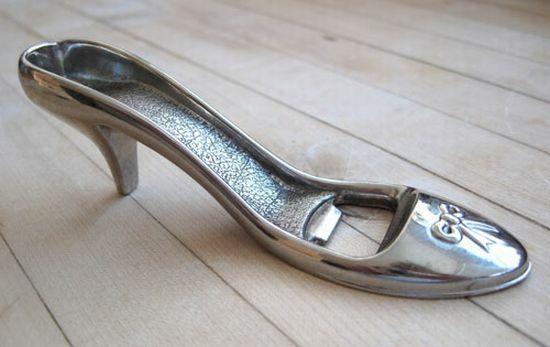 This “High Heel Bottle Opener” is definitely one of the most unique and classic pieces of openers in the market. The ladies’ shoe has a matching men’s oxford with the opener molded into the sole. Try thinking of some extra function that a conventional cap can do. Probably have an in-built head massager or some hidden pocket? Those are old ideas. Guinness has come up with a unique and peppy idea. 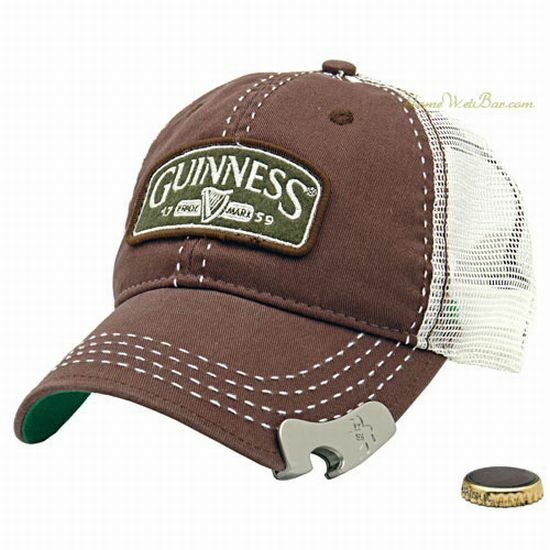 It’s an actual Guinness Baseball Hat with a Bottle Opener. This cap has a metal hook right on the edge to break open the bottle caps. 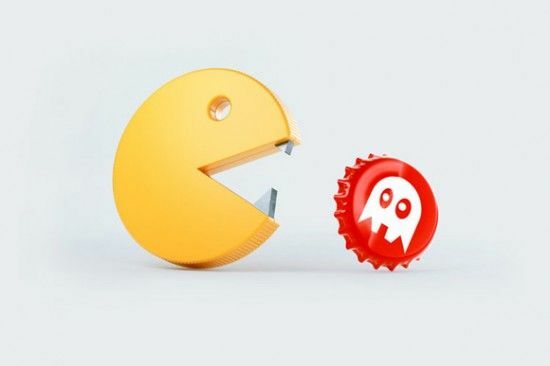 Ukrainian Studio Psyho has come up with the design of a “Pacman Bottle Opener” which will not only open your bottles but also act like a keychain. This “Pacman Bottle Opener” will let you show off your love for game and also prevent losing your keys. The “Weeble Bottle Opener” is cute and different from the conventional looking bottle openers we have in our kitchen. 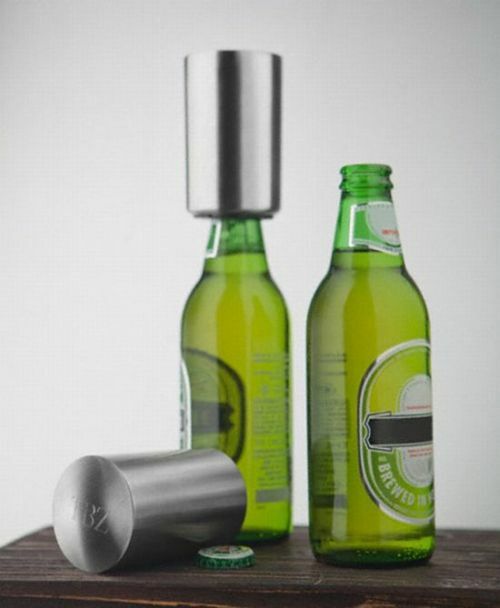 The bottle opener can open several other cans and bottles besides beer bottles. Moreover, it comes in a variety of bright colors. 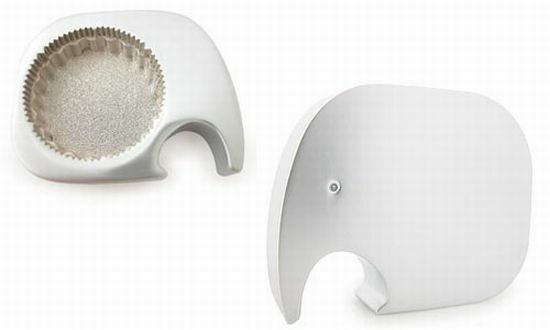 The “Elephant Bottle Opener” is a cool and cute looking bottle opener. The trunk of the elephant is used to hold the cap and the back is used to twist and open it. Recycled objects are always exclusive as they are converting wastes in something useful. Here is a “Phone Bottle Opener” which is made up of old telephone. 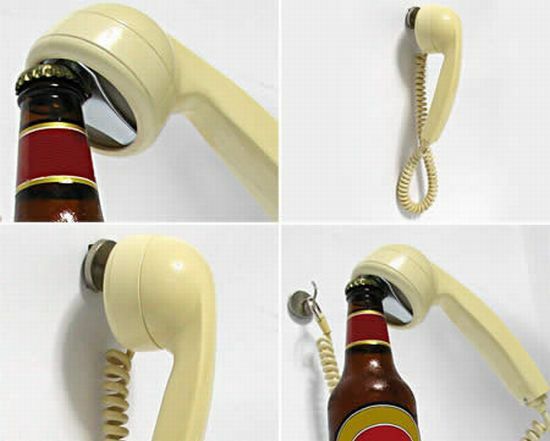 An authentic telephone handset recycled into a cool bottle opener, which can be decoratively hung in your kitchen or around your bar. I’m extremely inspired with your writing abilities and also with the structure in your blog. Is that this a paid topic or did you modify it your self? Anyway keep up the excellent quality writing, it is uncommon to see a great blog like this one these days..